It wasn’t until I reached third grade and got “Charlie and the Chocolate Factory” as a present that I became an avid reader. Now a new, free ebook lending service eBook Fling, may happily and conveniently add to my reading habit . eBook Fling takes advantage of the fact that you are allowed to lend a copy of your Kindle book or NookBook one time for up to 14 days. The service acts as a matchmaker, putting together people who have books with the people who want them. Until now, I’ve gotten get free ebooks from my local library, Project Gutenberg, the Google eBookstore—even Amazon and Barnes & Noble. But the selection is limited and I usually end up buying them. With new releases typically costing between $7.99 and $14.99, it gets to be an expensive habit. When you hit the “Borrow Now” button, eBook Fling contacts the person who owns the book and requests that they lend the book to you. eBook Fling sits in the middle so the borrower and loaner don’t make contact directly. This ensures everyone’s email addresses remain anonymous and that lending credit is distributed properly. If the lender accepts your request, eBook Fling sends you a code to borrow the book. In 14 days the book disappears from your library. To lend books, you go to the site and list all of your lendable books using eBook Fling’s searchable catalog. Not all publishers let you lend their books, so it’s worth checking to avoid inputting a bunch of un-lendable titles into your lending library. If you have a Nook or the Nook app, your lendable books will have a “lendable” flag on them. For Kindle users, it’s not as easy. The best way to check is by logging into “Your Account” on Amazon.com. In the “Digital Content” section you’ll see a link to “Manage Your Kindle.” After clicking on it, you’ll scroll down to the “Your Orders” section. Clicking on the “+” next to each title reveals more details, including a “Loan this book” button if the book is lendable. Ideally, the lending process would work quickly, but it’s all dependent on the lender receiving the email, actually reading it and acting upon it. If the first lender on the list doesn’t respond within a day, an email is sent to the next available lender and so on. If after 7 days there’s no response from any lender, your request is cancelled and you get your credit back. eBook Fling just launched this week, so the process may take a little longer than it will in the future. I put some requests in yesterday and am still waiting. 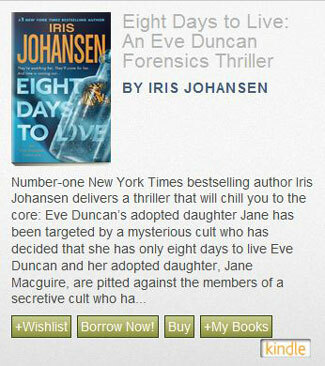 So whoever is out there holding onto their lendable copy of Iris Johansen’s “Eight Days to Live,” please “fling” it my way. I woul love to win this Kindle because I love to read, and thi would be an excellent way to carry and ready my whole “library” of books! What fun. I paid into ebookfling and now can not get any books that I want (via Kindle ap). Everything is lending disabled. Their “help” is pretty much “too bad for you”. Do not give them any money!!! S., I’m sorry to hear you’re frustrated. 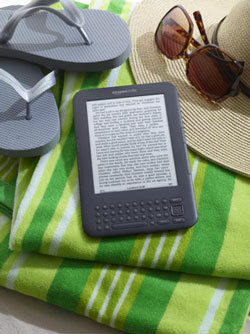 Thousands of Kindle books are lending enabled, and more than 50,000 eBookFling members are trading them all the time. You may be referring to the fact that some popular titles are still lending disabled, as not all publishers have come around to the idea of ebook lending. That is, unfortunately, not something we can control, though we are working constantly to communicate with publishers about the positive impact of lending on sales. It’s unclear from your comment if your difficulty is with the Kindle app or our services. Feel free to email me directly (rebecca at ebookfling dot com) for more personalized help. I signed up 6 months ago after buying 10 credits and have yet to get a single book. I have a Nook color and every time I search for books to trade, they’re not available. when I go to browse the instant download section, one must choose “next page” to go forward and the pages take forever to load, with no way to skip forward, and they all seem to be Kindle only. A book will come up and I will be so thrilled I say I want it, only to realize it’s a kindle book I just accepted since the browser keeps reverting to Kindle with each page refresh even though I have chose to search for Nook books only. I bought 12 credits on this but read only one book. This is not a good site unless you like obscure trashy books. No bestsellers available. Buyer beware. Most books aren’t available for lending because of publisher restrictions. Wish this had been more prominently displayed before I spent $20. Unfortunately, many publishers don’t make their works available for lending. This is a limitation from the book publishers, not eBook Fling. When we wrote this article two years ago we were hopeful things would turn out to be different. If you want to check out what is or is not available before plunking down you money (a good idea), you can browse the available titles on eBook Fling before you buy any credits. Also, I just created an account to see where things stand and received one free credit, which would let you do an initial test run to see if eBook Fling works the way they claim. I work full time, have a 6 year old and am lucky to read 2-3 pages a night before falling asleep…why is there such a short lend time limit?